Wherever you go you are likely to run into "creeping things" of some sort or another. A mosquito in your room keeps you awake at night, a cicada sings its song outside your window, a butterfly dances past you on a summer's day. In this delightful little book we get to meet a flea who swallows a giraffe, a grumpy cicada, a dragonfly who is love with a flower, and many more little creatures. The poems are often funny, sometimes lyrical, and they take many forms. Some even call for two people to read them. This format in particular is sure to appeal to children because they can have a friend or a sibling read or recite the poem with them. 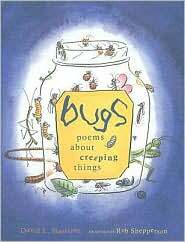 This amusing and very unique collection is not only enjoyable to read, but it will also show children that poetry can take many forms. It can rhyme or not, it can tell a story or not, it can be neat on the page or it can dance all over it. Children who fancy trying to write their own poetry will be delighted to discover that poems can be so versatile and creative.